The name of the kingdom ruled by the Ó Sionnaigh was Teathbha, who’s ancient origins lay in the 5th century AD and which covered much of the midlands of Ireland west of An tSionainn (the River Shannon), with territory comprising part of the modern counties of An Longfort (Longford), An Iarmhí (Westmeath), and Uíbh Fhailí (Offaly). Commonly the Ó Sionnaigh were known as the Kings of Teathbha, and latterly Lords of Teathbha. The term, Men of Teathbha, was often equated with the Ó Sionnaigh/Ó Catharnaigh family from the 9th to 14th centuries, though it also had the wider meaning of the people of all Teathbha, regardless of clan origin. The lands ruled directly by the Ó Sionnaigh/Ó Catharnaigh, their own territory, lay in southern Teathbha (Teathbha Deiscirt) and were known in Irish as the Muintir Thadhgháin, which was also an alternative name of the Ó Sionnaigh family (separate now from their Ó Catharnaigh cousins) and covered parts of Uíbh Fhailí (Co. Offaly), An Iarmhí (Co. Westmeath) and Laois (Co. Laois). From the time of Tadhghán (the late 9th/early 10th centuries) until maybe as late as the 13th century, the Ó Sionnaigh primary residence was probably in an area between present-day An Móta (Moate, Co. Westmeath) and An Grianán (Mount Temple, Co. Westmeath) called Dún Thadhgháin “Fortress of Tadhghán” (anglicised in the name of the townland of Dunegan). Nothing remains of this original fortress today as in subsequent centuries the family of Mac Amhalghaidh (Magawley) built their own stone castle on the exact site of Dún Thadhgháin (Dunegan, Co. Westmeath) however Tadhghán and his family’s presence in the area is also reflected in the name of the local townland of Cluain Uí Thadhgháin (Clonyegan, Co. Westmeath), meaning “Meadow of the Descendants of Tadhghán”. We also know the Sionnach or the Ó Catharnaigh were probably “named” or inaugurated upon the Leac Mhíchíl, a name which survived as a townland anglicised variously as Leaghoill, Leghill and Lacheill well into the 17th century in the parish of Baile Locha Luath (Ballyloughloe, in the barony of Cluain Lonáin or Clonlonan, Co. Westmeath) and later assimilated into the townland of Ballydoogan, Co. Westmeath. Leac in Irish means a flat slab of rock, flagstone, paving stone or bedrock and was commonly applied to royal inauguration sites. 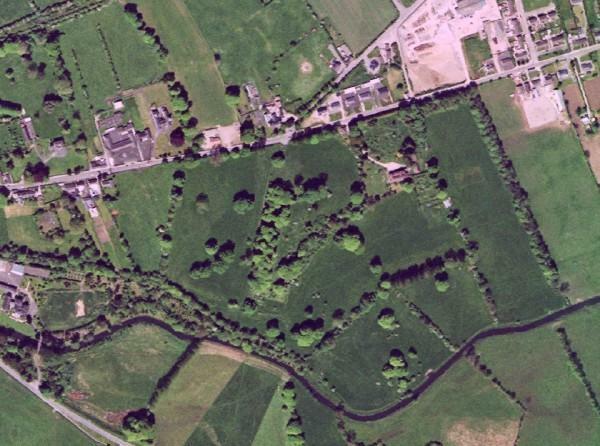 The Ó Catharnaigh/Ó Sionnaigh site was probably a low grassy hill in the northwest corner of Ballydoogan, with two conjoined earthen enclosures on to. The landscape has been considerably altered and the leac no longer remains on the hillside (or at least is now visible). If this site was as seems a genuine royal inauguration site of the Ó Catharnaigh there is every reason to assume that as the Ó Sionnaigh split off as a separate entity (and moved their lands further into what is now Co. Offaly) they created their own inauguration site. In relation to the above it should be noted that there is an annals entry in the year 1133, in which a one-year peace agreement was made between two kings at an ancient site of Uisneach (Cnoc Uisnigh or Ushnagh Hill, Co. Westmeath) an enormously important pre-Christian cultic site, the reputed centre of Ireland. This small hill just west of An Muileann gCearr (Mullingar, Co. Westmeath), is located in what was then Teathbha, traditional Ó Sionnaigh territory. 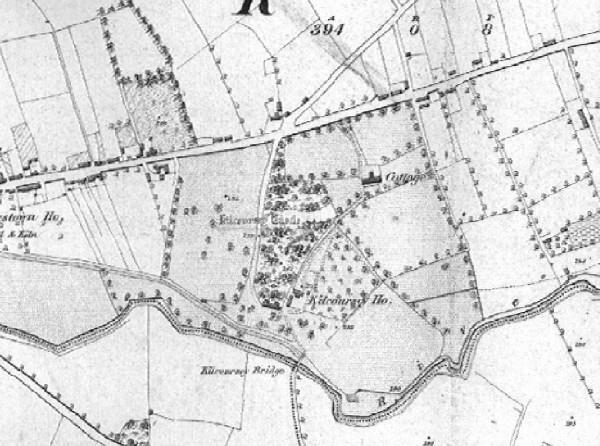 The place where this agreement took place was reported to be “near Uisneach” and was called Abhaill Chatharnaigh, “Catharnach’s Orchard” indicating that the Ó Sionnaigh territory was far more expansive than it was in later centuries (though the exact location of the “Orchard” is now unfortunately lost). From the 13th century or earlier the Norman-English and English anglicised the name of the Ó Sionnaigh territory in their own language as Munterhagan (and its variants), the Muintir Thadhgháin from the mid-1200s comprising part of modern Uíbh Fhailí (Co. Offaly), An Iarmhí (Co. Westmeath). Around this time the Ó Sionnaigh were likely to have had their chief seat of residence in an area around Clóirtheach (Clara, Co. Offaly) and Béal Átha Chomair (Ballycumber, Co. Offaly). This is reflected in various Fox-related names such as Cluain Sionnach (Clonshanny, Co. Offaly), the “Meadow of the Fox”, or Cloch an tSionnaigh (Cloghatanny, Co. Offaly) or “Rock of The Fox”. According to strongly held folklore this rock was used in the inauguration ceremony of new lords of the Ó Sionnaigh and for and other important events, and still exists in a field of what used to be the rear garden of the 19th century Cloghatanny House, on a road between Clóirtheach (Clara, Co. Offaly) and Béal Átha Chomair (Ballycumber, Co. Offaly). Though the claim dates back at least to the 1800s some have challenged it believing it to be a creation of the local gentry in the area to add prestige or romance to their estate in which the rock was located. However there does not seem to be any particularly strong reason to doubt the association with the Ó Sionnaigh clan inherent in the very name of the site. The rock itself consists of two or more large stones together, is generally oval, and about two meters high and with widths of two to three meters and flat on top. The inaugural rock (if that is what it is) lies within short walking distance of a small mound; this mound is locally understood to have an important but unidentified Ó Sionnaigh noble buried under it (hence, Tulchán na Bruíne, anglicised as Tolghannebrennye, the word tulchán meaning a “burial mound”). We know from the later Medieval period the Ó Sionnaigh had one of their main residences at Cill Chuairsí (Kilcoursey, Co. Offaly), also known as An Leithinse (Lehinch, Co. Offaly), just east of Clóirtheach (Clara, Co. Offaly) which survived up to the 1600s as Caisleán Chill Chuairsí (known now in English as Kilcoursey or Lehinch Castle). This was probably an Irish (Gaelic) Tower house, now unfortunately in ruins and in need of restoration. In the 16th Century the name Fox’s Country also appeared in English records alongside Munterhagan and its variants, though the size of the Ó Sionnaigh lands had shrunk considerably gradually reduced to a relatively small part of modern Uíbh Fhailí (Co. Offaly), An Iarmhí (Co. Westmeath). Part of the territory had been split off, and the English formed it into the barony of Cluain Lonáin (Clonlonan, Co. Westmeath). In the late 16th Century the remaining area of the Muintir Thadhgháin was given the English colonial title of the Barony of Kilcoursey, which was used alongside Fox’s Country, with Munterhagan gradually disappearing. By the 1800s, the ruins of Kilcoursey Castle, had become known as Lehinch Castle (though the older name has somewhat revived in recent times), and Kilcoursey House was built just south-east of the former Ó Sionnaigh residence.